Louis Coleman is facing multiple charges in connection to the the kidnapping and death of Jassy Correia, authorities said. 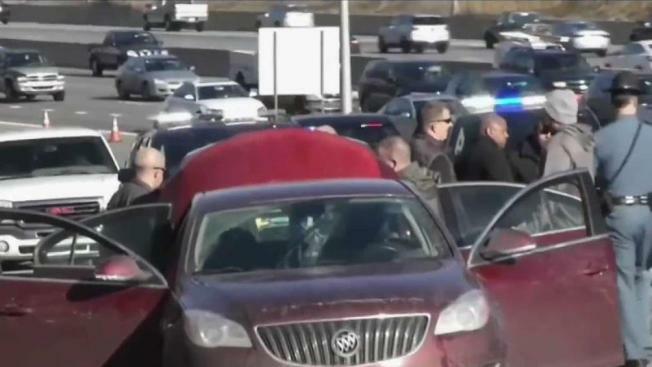 State police in Rhode Island are heading to Delaware to bring back a Providence man facing numerous charges in connection with the kidnapping of a young Boston mother whose body authorities say was discovered in the suspect's trunk. Louis D. Coleman has been charged with being a fugitive from another state in Delaware, and will be moved to Rhode Island to face multiple charges, including kidnapping, refusal to report a death with intent to conceal a crime and mutilation of a dead human body. It's unclear if he'll face charges in Boston, where authorities say 23-year-old Jassy Correia was last seen enjoying birthday celebrations with her friends just after midnight on Sunday at the nightclub Venu in the city's Theater District. At a news conference Friday afternoon, Suffolk County District Attorney Rachael Rollins said the case is complicated "with evidence in three jurisdictions." "There are moving parts in all of them. To protect the integrity of the evidence we have gathered, there are many aspects we simply cannot discuss today," said Rollins. "Whatever this case is ultimately charge, wherever it's charged and tried will be based on the evidence of the law." Her body was discovered inside the trunk of a vehicle in Delaware on Thursday, authorities said. "She was a mother, she was brave, she was strong,” Correia’s cousin, Katia Depina, said. "She did not deserve this. She went out to celebrate her birthday and never returned home. She did not deserve this. We want justice for her death." Rollins said authorities hope to bring the case either to Boston -- either in Suffolk County or in the U.S. District Courts in Massachusetts. "Right now, for the people who love Jassy most and for the entire Suffolk community, this isn't about jurisdiction," said Rollins. "This is about a daughter. This is about a mother whose 2-year-old daughter doesn't understand where she's gone and will no longer have a mother. It's about devastating loss for family members who lost a central part of their lives." Thirty-two-year Coleman, of Providence, was taken into custody on Thursday in Delaware. He was considered a person of interest in Correia’s disappearance and then later a kidnapping suspect. At the Friday news conference with Rollins, Boston Police Commissioner William Gross said no woman should fear going out in the city. "No family deserves this. Women should be able to traverse anywhere without fear of being harmed," said Gross. "We've had tragedies in the past but we just want the folks of ill-intent to know that this just won't be tolerated in the city." Correia, who was the mother of a 2-year-old girl, was last seen leaving the nightclub just after midnight on Sunday. Surveillance footage captured her getting into a red car with an unknown man, who is believed to be Coleman. Her family had been trying to reach her for days and increasingly became worried. They were unable to get in contact with her for her birthday on Tuesday and filed a missing persons report on Wednesday. Now, Correia’s family is seeking answers as they process the devastating tragedy. The woman’s relatives said they had never heard of Coleman and do not believe Correia knew him, either. Boston Mayor Marty Walsh offered his condolences to the Correia family via Twitter. He said the city is mourning the loss of Jassy Correia.